If you have a regular refrigerator-freezer, then you understand the joy of having only a tiny space in which to freeze food. Maybe you've thought about getting another freezer, but don't know if a chest freezer or upright is right for you. Perhaps you'd rather have a chest freezer, and that's that. 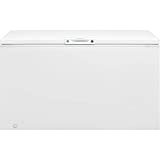 If a chest freezer is what you're looking for, you should consider Frigidaire's line of chest freezers, like their FFFC16M5QW. With a chest freezer, you can freeze a significant amount of food and keep it until you need it. What Is a Frigidaire FFFC16M5QW Freezer? How Do Customers Feel About Frigidaire’s FFFC16M5QW Freezer? How Does the Frigidaire FFFC16M5QW Compare to Other Brands? Chest freezers have an advantage in that they're made for food storage. You can buy a lot of food that's on sale and freeze it in a chest freezer. A hunter would find a chest freezer useful for all that meat they bring home. People who buy their frozen foods in bulk could make good use of a chest freezer, too. Take a look at Frigidaire's freezers to see if they have one that will fit your household's needs. 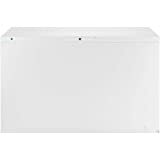 A Frigidaire FFFC16M5QW is a 15.6 cubic foot chest freezer. It opens from the top, rather than the front like your refrigerator-freezer or an upright freezer. 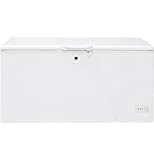 Chest freezers tend to be less expensive than upright freezers, and have more storage room. They’re also more energy efficient than upright freezers, making them a better option than upright freezers for anyone looking for something budget-friendly. The Frigidaire FFFC16M5QW has an exterior height of 35 inches, a width of 55 3/4 inches, and a depth of 27 1/2 inches. The interior dimensions are 29 1/8 inches high, a width of 42 3/4 inches, and a depth of 22 1/2 inches. Its ArcticLock walls are thicker and insulated in such a way that your food will stay cold for up to two days in the event of a power failure. Its temperature control is on the bottom left side and is a manual dial rather than a digital display. Despite that, Frigidaire’s FFFC16M5QW maintains a temperature of -10 to 10 degrees Fahrenheit. 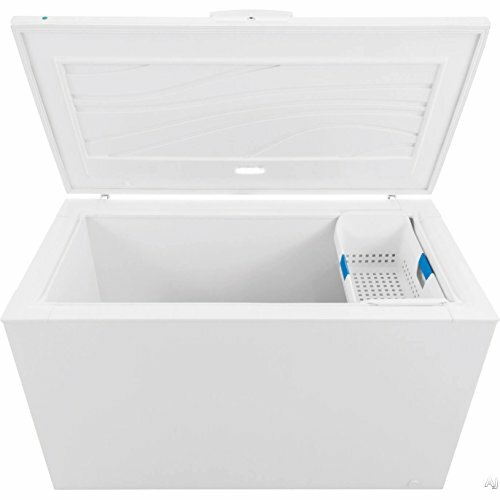 This freezer also comes with a power-on indicator light and LED lighting inside, as well as one storage basket. Unlike upright freezers, this freezer does not have an organization system beyond that one basket. You also have to defrost it manually because it doesn’t have an automatic defrost cycle. Frigidaire has discontinued this particular freezer. However, that doesn’t mean it’s completely unavailable yet. Local appliance stores in many areas around the country still sell it for between $500 and $700, but they may offer deep discounts to help clear out their inventory. If you’re interested in buying a Frigidaire FFFC16M5QW, check with your local appliance stores to see what they have. If you can’t find a Frigidaire FFFC16M5QW, they do have a similar freezer that may work for you. Their FFFC15M4TW 14.8 cubic foot chest freezer is slightly smaller, but is still a quality freezer, with features comparable to those of the 15.6 cubic foot freezer. It even has a couple of features that the FFFC16M5QW doesn’t have. For instance, the 15.6 cubic foot freezer only comes with one basket, while the 14.8 cubic foot one comes with two. You can also buy castors for this freezer, whereas you most likely can't with the 15.6 cubic foot freezer. They both come with LED lighting and a power-on indicator. Because they’re chest freezers, neither one has an automatic defrost cycle, but they both have a manual defrost drain. They both also run at -10 to 10 degrees Fahrenheit. This freezer is readily available on Frigidaire’s website, as well as those of Home Depot, Lowe’s, Sears, Best Buy, and Amazon, and most likely at your local appliance stores. Electrolux, which is Frigidaire’s parent company, offers a limited warranty on all their major appliances. It covers repairs any problem that occurs within the first twelve months of your purchase. You can purchase up to three years of protection, which may even cover a brand-new appliance if technicians decide they can't fix yours. Since Frigidaire no longer makes its FFFC16M5QW 15.6 cubic foot freezer, we looked at customer reviews for their 14.8 cubic foot freezer. Customers like these freezers for their space, their lighting, and their ability to keep food frozen even in hot temperatures in garages. They also think it’s reasonably priced for their needs. Some customers mention this freezer saving them money on their groceries. This is because they can buy more food when it’s on sale, and store it for longer. A few have improvised organization systems with small totes or bins, saying the space inside the freezer allows them to do that. This probably saves them a little money on additional baskets. Customers who have problems with this freezer cite visible gaps in the interior walls. They also say the door seal is so strong they have trouble opening it, and also that the seal can leak water. Some customers mention concerns with icing, but since the freezer doesn’t have an automatic defroster, the icing is normal. The chief complaint via Google is that various sellers deliver a damaged freezer, which is working against Frigidaire in the reviews. Customers only give it 4.1 out of 5 stars there. A chest freezer is a chest freezer, right? Maybe not. Frigidaire is known for its quality food storage appliances, but other appliance manufacturers make chest freezers, too. How does Frigidaire stack up? GE advertises their freezers as being "garage-ready," and will keep food frozen in temperatures up to 110 degrees. GE's 15.7 cubic foot chest freezer is slightly larger than Frigidaire's, so you have a little more space inside. Unlike Frigidaire, it has a temperature alarm to let you know if something's wrong. This freezer has interior LED lighting, and it's Energy Star-rated, which is another advantage GE has over Frigidaire. Like Frigidaire, though, it comes with two slide-out storage baskets and an exterior power-on indicator light. GE sells this freezer through many sellers, including Home Depot and Best Buy. Customers who bought GE's 15.7 cubic foot freezer enjoy both its size and its storage system, and they say the baskets and brackets are durable and easy to use. Their primary complaint seems to be that the frost inside builds up way too quickly. Some customers complain that frost began building up inside their freezers almost immediately. This means you have to defrost the freezer more often than you might with a Frigidaire. Some customers also believe a freezer this size needs a better storage system, which is comparable with Frigidaire. This freezer gets 4.8 stars out of 5 on Google. Whirlpool appliances are popular competitors to Frigidaire. They have a 15 cubic foot chest freezer, which is just about the same size as Frigidaire's 14.8 cubic foot freezer. It has comparable features to Frigidaire as well, including two storage baskets and a manual defrost drain. Its interior lighting is incandescent, which means it's less energy efficient than Frigidaire's freezers. That also means that the light isn't as reliable as that of a Frigidaire FFFC16M5QW or FFFC15M4TW. Overall, Whirlpool's freezer appears to be somewhat lower-quality than Frigidaire's, and its prices reflect that. At $400 to $600, it might fit your budget better. However, you may also get what you pay for. While many customers enjoy the size and storage system inside Whirlpool's freezer, many others have received defective freezers and had problems getting technicians out to fix it. Many also complain that it's prone to compressor failure, particularly with large quantities of meat inside. That's a significant strike against Whirlpool and something from which Frigidaire doesn't seem to suffer from the same frequency. Customers give Whirlpool's freezer 4.6 stars out of 5 on Google. Amana is a trusted appliance brand which, like Whirlpool, sells a 15 cubic foot chest freezer. It features what Amana calls Deepfreeze technology, designed for long-term food storage. Like the other freezers mentioned here, including Frigidaire's FFFC16M5QW, it comes with two storage baskets, and you must defrost it manually. Amana's freezer does not have an interior light. If you plan to keep your chest freezer in your basement or garage, you might have some trouble finding food inside Amana's freezer. You can find this freezer for between $500 and $600 from several different sellers. According to customer reviews on Google, things like a temperature alarm and an interior light are optional, and at least one customer doesn't like that. Overall, though, customers like that this freezer is quiet and easy to operate. As with Frigidaire's FFFC16M5QW and its smaller, 14.8 cubic foot freezer, customers most enjoy the space and the baskets inside Amana's 15 cubic foot chest freezer. The two brands are comparable in pretty much every way, including quality. This freezer gets 4.6 stars out of 5 from customers on Google. As one of Frigidaire's biggest competitors, Maytag's brand is well-known and popular. They sell a 15 cubic foot freezer, but it doesn't have all the same features as Frigidaire's 15.6 cubic foot freezer or its 14.8 cubic foot freezer. It has an incandescent light, meaning it takes more energy to cool down the inside and keep it cold. Incandescent bulbs don't last as long as LEDs, and are, themselves, much less efficient than LEDs. This gives Frigidaire a similar advantage over Maytag that it has over Whirlpool. It's a little cheaper than Frigidaire, costing between $500 and $600. Customers generally have positive things to say about Maytag's 15 cubic foot chest freezer. Some customers are especially happy with its ability to freeze and maintain large amounts of meat they acquired while hunting. However, there are several complaints about its quality. Specifically, some have lost hundreds of dollars worth of frozen foods because the freezer either quit prematurely or never got cold enough to keep stuff frozen from the start. They give Maytag's freezer 4.5 stars out of 5 on Google. We used Frigidaire’s website to gather information about both their 15.6 cubic foot freezer and their 14.8 cubic foot freezer. To gauge customers’ opinions, we went through reviews on Amazon, Home Depot, Lowe’s, and Best Buy, as well as those on Frigidaire’s website. We also used these sites to determine the pros and cons of owning the 14.8 cubic foot freezer. Our brand comparisons were gathered from customer reviews on their home websites, as well as Home Depot, Lowe's, and Google. Even though Frigidaire no longer makes this freezer model, there are still reviews on their site about it in addition to the 14.8 cubic foot freezer. Both freezers have their pros and cons, and we’ve listed some below. We can’t recommend Frigidaire’s FFFC16M5QW 15.6 cubic foot model since the company discontinued it. Their 14.8 cubic foot model may be a little smaller, but it still serves customers’ needs very well and still has more storage space than a Frigidaire’s 20.5 cubic foot upright freezer. It keeps food frozen solid even in areas with no climate control, like basements and garages. This freezer is an excellent solution for people who need a lot of additional freezer space.